Using the pasta water gives you a little salty pasta flavor that is traditional Italian cooking. Now you can use any noodle that you prefer. This recipe was one that was inspired by my recent trip to Tuscany. I have never had Pici pasta before, I don’t think I have ever seen it, before spending a week in Cortona, Italy. I had Pici on three different occasions during that week. Once was with squab that was amazing and the other two were with ground veal which was equally amazing. I was in love immediately with Pici. 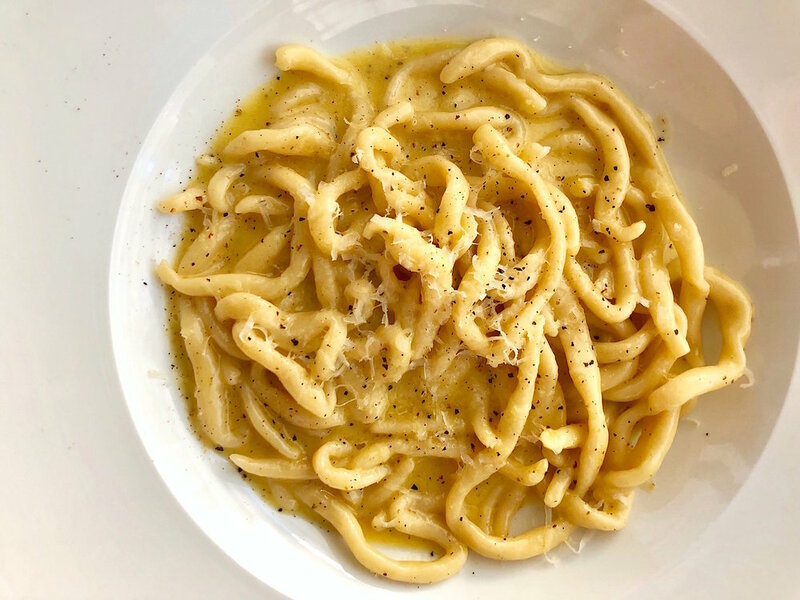 All three dishes had this basic butter sauce, maybe a touch of cream added, but typically what you would see in northern Italian pasta cuisine. Pici noodles are a mix between spaghetti and bucatini except the noodle aren’t hollow like bucatini. It is a basic eggless or dried pasta dough that is rolled out into ropes. Not too thin, the noodles should be a little bigger/thicker than spaghetti. I didn’t take the time to completely dry these noodles out so I used them more like a fresh pasta. Here is the easiest pasta recipe, I hope you enjoy it! Fill a large pot with salt water and bring to boil. Add the pasta to the water and cook for 3-5 minutes until tender. Meanwhile in a large sauté pan add 3/4 cup of the reserved pasta water, the grated Parmesan and Butter. Swirl the pan around so that the butter and cheese start to melt and become a sauce like consistency (1 minute). Add the drained pasta, toss to coat the pasta well and season with salt. Garnish with black pepper and more parmesan cheese. Serve and enjoy this fantastic, easy pasta dish that will quickly be a go to, in your recipe book!.